"With a monograph-level introduction and solid, detailed use of background sources, Craig Keener has provided us with a rich gem of a commentary on Acts. One can use it and get a real sense of what this key work is all about." "Somewhat surprisingly, a socio-historical approach to Acts still needs to be defended and its value demonstrated. No one does this better--is more informed about ancient literature, parallels, and precedents, and more interactively and fruitfully engaged with contemporary literature and issues--than Craig Keener. In the introduction (a monograph in itself), his treatment of the genre of Acts, especially his judicious discussion of the genre 'novel,' of the character of ancient historiography, and of the historical integrity and value of Acts, is unbeatable in today's market. For anyone wanting to appreciate how Acts 'worked' in its original context and to get into the text at some depth, Keener will be indispensable and 'first off the shelf.' Bring on volumes 2-4!" "Early Christianity developed in a complex and multifaceted context, one that Craig Keener masterfully presents in this socially and historically oriented commentary on Acts. As one has come to expect from Keener, there is thorough knowledge and use of the best and most important secondary literature in the areas of concern and abundant utilization of a wide range of ancient sources. This is a commentary that will continue to serve as a detailed resource for both scholars and students wishing to explore these crucial dimensions of the book of Acts." - Publisher This insightful commentary, the first of four volumes on Acts, utilizes an unparalleled range of ancient sources and features Keener's meticulous research. 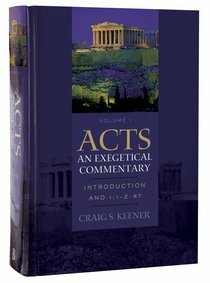 About "Acts Introduction and 1: 1-2 47 (Volume 1) (#01 in Acts An Exegetical Commentary Series)"
This insightful commentary, the first of four volumes on Acts, utilizes an unparalleled range of ancient sources and features Keener's meticulous research. Customer Reviews For "Acts Introduction and 1: 1-2 47 (Volume 1) (#01 in Acts An Exegetical Commentary Series)"
Recent years have witnessed the arrival of several larger-than-usual exegetical commentaries on the book of Acts (e.g. Dr Darrell Bock's in the BECNT series, and Dr David Peterson's in the PNTC series). It almost seems that there is a concerted effort on the part of NT exegetes to out-comment each other! Enter Professor Craig Keener, a man well known (and well regarded) for producing exhaustive commentaries on NT books and themes (e.g. note his definitive, two volume work on the Gospel According to John; and his very recent two volume work on the subject of miracles). Professor Keener's current commentary is the first of four slated for publication by Baker Academic. As is usual for this author he has mined the primary literature of the ANE and Greco-Roman worlds, drawing and noting parallels to the events detailed in Acts where such are warranted. This is definitely a strength of the commentary. Two weaknesses will suffice: First, the massive volume of detail presented in the pages of the commentary often conceals the forest for the trees. Second, upon occasion Professor Keener's exegeses appear to owe more to received theological traditions and influences than they do to a strictly grammatical and historical review of the Greek text (I note, particularly, his handling of the Pentecost theophany). To conclude: 1,038 pages of tightly argued writing on simply the first two chapters of Acts is probably more commentary than the average Christian reader or preacher could likely digest! Such would doubtless gain greater value, more quickly, from either Marshall (TNTC) or Bruce (NICNT). The specialist and scholar, however, will find this work to be a boon.